After seeing several James Bond films, Keith enrolls in his first martial arts class. at the tender age of six (1966). He studies for a short time, before his family moves to Italy for a year. In his teens, Keith spends a little under a year with formal instruction in Tae Kwon Do. Tae Kwon Do taught him a lot, and got him going in the right direction. Unfortunately, he was easily beaten by a JKD practitioner. The Bruce Lee follower seemed to use Pascal's Tae Kwon Do against him. So Pascal switched to Shotokan Karate for a brief time. From there, he got his first introduction into Bruce Lee's Jeet Kune Do (1976). In 1980, Keith Pascal started studying full time with Steve Golden. Steve was an original Ed Parker black belt in Kenpo, and he was one of the privileged few to study with Bruce Lee. Yes, he was one of the special students who continued to study with Bruce Lee, after Bruce closed down his schools. To this day, Keith still considers himself a Steve-Golden student. He checks in with Steve a few times a year. In 1982, Keith started teaching a group of students part time. He continues this practice, to this day. In the 80s, Keith also started taking lessons and seminars from some of the other Bruce Lee originals -- Dan Inosanto and Ted Lucay-Lucay, for example. 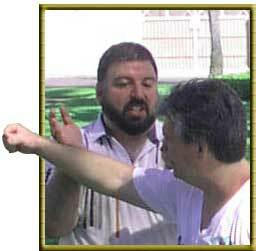 In 1985, Keith earned his first level teacher's certification in Twin Dragons Method (also certification to teach JKD). While teaching high school on the Oregon Coast, Keith continues part-time martial-arts lessons. He teaches a night self-defense class for the community college, a group of high-school students after school, and even a private class for the principal and the dean of students (a former golden-gloves boxer). In the mid 1990s, the Jun Fan Jeet Kune Do Nucleus formed to try to maintain some historical integrity to the way Bruce Lee practiced martial arts. Hanging out with this group gave Keith the opportunity to further research the Bruce Lee connection to coin snatching. (He also learned more martial arts from original Bruce Lee students, including Bob Bremer, Pete Jacobs, Steve Golden, Daniel Lee, Richard Bustillo, Ted Wong, and others. 1998 saw the birth of Keith's first martial arts book, Wrist Locks: From Protecting Yourself to Becoming an Expert. Also the birth of the Pascals' daughter, Quinn Riana Pascal. In 1995, Keith and his wife, Kathryn, had moved to Eugene. They both started teaching new groups martial arts. Keith wrote Wrist Locks with his students in mind. Keith broke away from high-school teaching and began writing martial arts full time. ... Plus a dozen other ebooklets 20 - 50 pages each. Keith Pascal is also the senior editor of Martial Arts Mastery: A Tell-All of Tips, Tactics, and Techniques. This is one of the longest-running martial-arts ezine.